Little E was blessed with many wonderful traits. When he is not whining, he is actually the more affectionate of the Yoys. He hugs and open mouth kisses like a champ. There is one area that Little E has struggled with since birth. His skin. He most always has some sort of rash/breakout on some part of his body. Little E's bedtime routine consists of a full body coating of a few different creams and topical medicines recommended by his doctor. He knows the drill and each and every night we go to war over the process. I thought that putting him into pajamas was a battle. Ha! I now laugh at that! I wish I was just putting him into pajamas. It starts with him trying to roll off his changing table. I almost want to let him make the leap so that I can tell him I told him so. But then I snap back to reality. Then the screaming. Good lord, does he scream. I recheck the bottle. Is this acid or is this Cetaphil? Nope, it's just Cetaphil. Good to know. Good to know. Next up he starts throwing all the jars and tubes of lotion back into the basket on his changing table as fast as I can take them out. WHY DON'T THESE TABLES COME WITH STRAPS?? WOULD MR. YOY BE MAD IF I PUNCHED A HOLE IN THE WALL WITH MY OWN HEAD? Once I get his body covered, I move onto his face. I scoop my finger into the Eucerin jar and pull out a glob of goodness. For whatever reason, Little E tries to eat it. He's like a baby bird following my finger around. Trust me, I'm sure it doesn't taste good. This is coming from the girl who accidentally licked her deodorant in college because it smelled like candy and was jokingly eating it. And it tasted horrid. So I don't recommend it. Anyway, I do my best to smear Little E's face. Sometimes it gets in his hair, eyebrows, up his nose, and occasionally his mouth. Until I have to put his pajamas on. I guess it could be worse. I could be dealing with this guy. 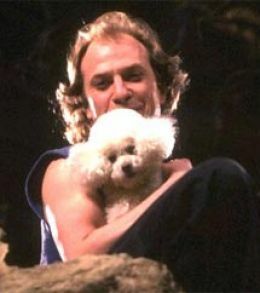 Also, for those that are keeping track, this is my SECOND Silence of the Lambs reference.